Age is nothing to shy away from. Ladies of a certain age have had incredible life experiences and lived through times that younger people can’t lay claim to. But while a few gray hairs might be nothing to sneeze at, you probably wouldn’t want to look a great deal older than you truly are. If you’re like most women, you likely already have a bag of tricks you use to enhance your natural beauty. But do you know how to wear jewelry to your advantage? Consider adding the following tips to your repertoire. 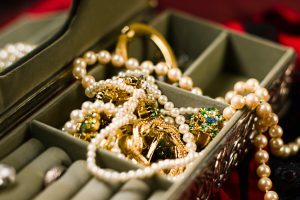 Many women have long-established preferences for either silver or gold. Unfortunately, if you make the wrong choice, you could end up adding years to your skin. The wrong metal can enhance dark circles under your eyes and an uneven skin tone. So which metal is right for you? It all depends on your skin undertone. If you have a warm undertone, you should choose gold. Ladies with a cool undertone should choose silver. Not sure which undertone you are? There’s an easy way to tell! Just take a look at the underside of your arm. See your veins? If they look bluish, you have a cool undertone. If they look greenish, you have a warm undertone. It’s an unfortunate reality of aging that the skin and collagen will start to droop. Your earlobes are no exception. If you select very heavy, large earrings, your earlobes will be pulled down farther. This will accentuate the problem, and it will also call attention to the neck, which you may be more interested in camouflaging at this stage in your life. Instead, look for lighter, smaller earrings. Consider choosing sparkling earrings in colorful hues that draw out the color in your eyes. This will help you appear more youthful and energetic. During the 80s and 90s, jewelry sets were all the rage. Women loved to wear earrings, necklaces, and bracelets that all matched each other perfectly. These days, however, wearing jewelry sets will only betray your age. Instead, don’t be afraid to break up your jewelry sets. Complement your jewelry pieces, rather than matching them. F. Silverman Jewelers features a broad selection of timeless and trending jewelry for modern women. Choose from our fine and fashion jewelry, or have our experts craft a custom piece just for you! We carry top brand names, including jewelry designers Dabakarov, Norman Covan, Zable, and Charles Krypell. If you’re looking for something special, give us a call today at 201.930.8883. Or, stop by our store location in Woodcliff Lake, NJ!